1920 was the year that this memorial was unveiled. A centre for the nations grief and somewhere to remember The Glorious Dead. It was there to remember all of the British, and Empire, dead in the conflict. Be them known or unknown. We know what went on that day in November as the Pathe newsreel were there to cover the event. This footage still exists and even better, Pathe has uploaded it, as well as most of the rest of their archive onto the web. 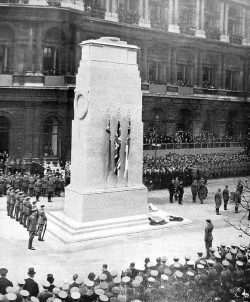 This was a ceremony that was repeated for the next 95 years. A sombre moment to remember those who gave their lives so we can have our tomorrows. All the traditions that we recognise from the service that we now know started that day. The sombre memorial. The laying of the wreaths. The march past of servicemen. Sadness but with a hint of hope. Hope that there wasn’t going to be another bloody World War. How wrong they were. Those seeds were already being cast in the air. In under 20 years the world would be at war. A more terrifying one than had finished two short years previously. No poppies were on display that day. Not out of respect but that tradition hadn’t started then. 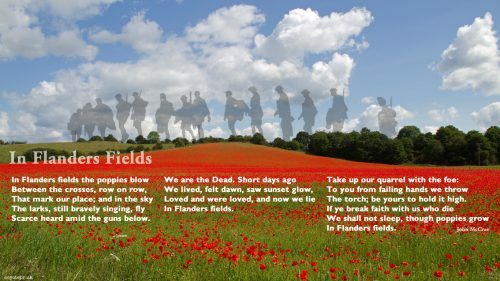 It was 1921 when the American Legion, inspired by the poem “In Flanders Field“, first used the Poppy as a sign of remembrance. Not only that, the wearing of artificial poppies was a French idea that was adopted by the Royal British Legion after Anna E. Guerin sent poppy sellers to London. Today, when you bow your head in remembrance. Do this not just for the people of your country who died fighting but for all people. Be that the men and women who were fighting but also the innocents. The civilians who were killed in bombing raids of their city or needlessly in other ways. Remember them all and hope that this will not happen again.